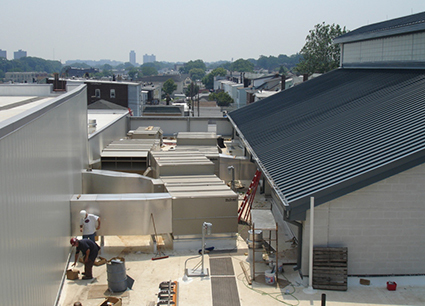 in commercial buildings in the U.S.
MSC received a call in May from a client involved in construction of a school in Hudson County, New Jersey. The building was a stand alone facility and approximately 100,000 sq/ft in size. A temporary certificate of occupancy was issued at substantial completion and the school was opened. 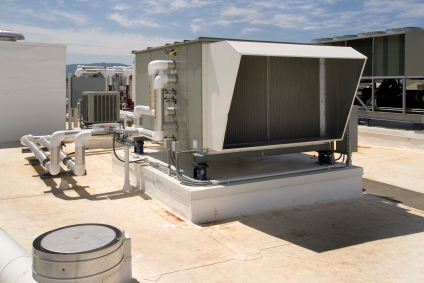 Through the first season, the facility was uncomfortable with many complaints from the occupants and a final certificate of occupancy would not be provided until the HVAC systems were working properly with the current temporary certificate of occupancy set to expire at the end of the school year. Nothing was being done to rectify the problems as everyone claimed that they had fulfilled their contract. MSC was retained to examine a sampling of systems, perform diagnostics and clearly identify the root causes of the problems. This included evaluation of classroom units, split systems, VAV systems, the hot water heating system and the building control system. We were also asked to check systems that were not working at all. We assembled a simple plan for phase one with our client that addressed the most pressing issues. Like any investigation, things started turning up immediately and continued to focus on getting the full picture. At the end of phase one, we prepared and presented an objective presentation which was attended by the interested parties. This led to phase two, and then onto phase three with a continuation of the presentation at the end of each phase (please see the pdf). During the diagnostic process, any minor items discovered that could be corrected in five or ten minutes were repaired and a note made alerting the client that this same problem may exist on other systems not being examined. MSC maintained daily contact with our client to advise them of what we were doing, where we were working, and what was accomplished each day. As seen with most diagnostic evaluations, there is rarely one culprit causing the difficulties. As was the case here, there were a multitude of mostly small issues that needed to be identified so the installing contractors could be brought back to correct them. In this case, there were installation problems, lack of proper equipment start up, maintenance issues and the occasional design question that had to be answered before direction for correction could be given. Our diagnostic report with photos and meeting between all parties, clearly illustrated the problems and causes. Our presentation was objective in nature; however during the final presentation, it became apparent which party was responsible for the correction of each problem and those parties agreed to make the corrections without objection. In the few cases where the problems weren't corrected, MSC was instructed to move into the repair stage which we did immediately. This process allowed our client to close out the project, receive final payments and turn over a building that was working properly. In summary the investigation/diagnostics and proper reporting left little to the imagination, ended the finger pointing, caused repairs to be made and the final certificate of occupancy to be issued. Value was created for everyone.